Italian sculptor, part of a family of sculptors, active in Florence and elsewhere in Italy from the late 15th century to the 16th, particularly noted for works in glazed terracotta. He was the son of the sculptor Giovanni di Bernardo (1429/30-c. 1510) and possibly a pupil of Andrea Verrocchio. He probably worked with Andrea della Robbia, whose glazing techniques he learnt. In the early 1480s he opened his own shop, producing works in the style of della Robbia, often with compositions after Verrocchio, Antonio Rossellino or Benedetto da Maiano. His first documented work dates from 1484: a relief of the Descent into Limbo (untraced) for SS Annunziata in Florence. From 1487 to 1490 he and his brother Francesco (1462-1520) went to Perugia, where he executed for the cathedral the stone altar of the Holy Ring, of which only the busts of Isaiah and David are extant, and many works in glazed terracotta for the monastery of S Pietro dei Cassinesi, including a pulpit and a basin with Christ and the Samaritans (both in situ). Among works from the 1490s are: the glazed altarpiece of the Resurrection (1490; Pistoia, Museo Civico) for Pistoia Cathedral; a frieze (c. 1493; London, Victoria and Albert Museum) for the main chapel of S Chiara in Florence; an altarpiece of the Crucifixion (1490-95; Radicofani, S Pietro); and the lunette with St Mary of Egypt (Florence, Museo dell Opera del Duomo). Also in this period he and his brother executed many projects for the sanctuary of S Cristina in Bolsena, rebuilt by order of Cardinal Giovanni de Medici, notably the stone faade (1493-5), the effigy on the saint s tomb and an impressive tabernacle, the altar of St Christina . The important decoration (1500) of the oratory of S Maria delle Grazie near Stia (Arezzo) was among many commissions from the Florentine prelate Leonardo Buonafede (c. 1450-1544). Buglioni was one of those appointed to decide the location of Michelangelo s David (Florence, Accademia) in 1504, probably the year he produced the glazed decoration (destroyed) of the Del Bianco Chapel in the Badia Fiorentina. From c. 1500 his workshop produced terracottas with naturalistic colourings, such as the Virgin with SS Jerome and Nicholas of Bari (1502; Amsterdam, Rijksmuseum) and the Virgin with SS John the Baptist and Anthony Abbot (S Casciano, near Florence, S Giovanni in Sugana). Probably c. 1510 he executed the Coronation of the Virgin over the portal of Ognissanti and the St Lucy Adored by Angels over the portal of S Lucia dei Magnoli (both Florence). His last documented work is the Virgin with Child and Four Saints, commissioned by Buonafede for S Michele at Badia Tedalda, Arezzo (in situ), for which he was paid in 1517. From 1510-20 he produced many polychrome altarpieces, for example the Nativity (Montaione, S Vivaldo) and the Assumption (Barga, S Elisabetta), the latest being the Virgin and Saints for S Miniato al Montanino near Figline (dated 1520; Florence, Museo Ospedale degli Innocenti). 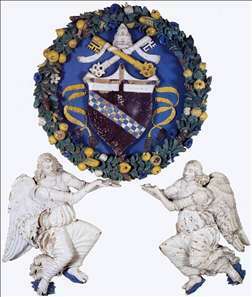 See more details about "Coat-of Arms Supported by Two Angels"